Ryu Hyun-jin of the Los Angeles Dodgers was replaced early in Saturday's home game against the San Francisco Giants after suffering a minor arm injury. 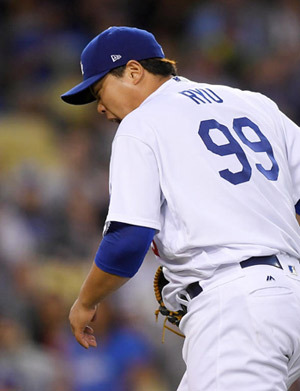 Ryu was struck on his throwing arm by a line drive by Jo Panik at the top of the third inning when the Dodgers were trailing 1-0 with one out. Ryu fielded the ball and threw it to first to get the out, but soon dropped his glove and complained of pain. Dodgers manager Dave Roberts came up to the mound to check on him, and took Ryu out of the game. Ryu threw just 2 1/3 innings, giving up three hits and one run. X-ray scans showed that Ryu suffered a forearm contusion, which is not considered serious. In a post-game interview, Ryu was confident he would recover soon. Roberts agreed it was promising the X-rays did not reveal anything more serious. However, the timing of the injury is unfortunate, with the team now in the run-up to the postseason. Saturday's game against the Giants was Ryu's final opportunity to prove himself. The Dodgers have clinched their division, but it is unclear if Ryu will be included in the starting rotation for the postseason games. Last week the team manager said he would audition Ryu for a relief spot in the postseason.